Please meet our team of professionals. Our team is committed to providing your heating or cooling needs with the best service possible. We believe you owe it to yourself, your family, or business to use a company that is second to none for installation, maintenance, and repairs. Brian is a 1982 graduate of the Smyth County Vocational School where he studied Industrial Maintenance mechanics. While studying there he became interested in air conditioning. After graduation he continued his interest in air conditioning by enrolling in the HVAC & refrigeration program at Virginia Highlands Community College where he graduated with a diploma and certificate. He then moved to south Florida where he worked and was trained to install, maintain, and repair all types of residential, commercial, and light industrial HVAC & refrigeration equipment. 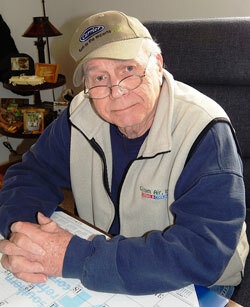 He then relocated back to Smyth County and started Custom Air, Inc. in the spring of 1993. Brian Has continually trained throughout his career in all areas of the industry including duct design, airflow, heat pumps, air conditioners, gas furnaces, gas fitting, geo thermal, thermodynamics, refrigeration principles, ice machines, compressors, electricity, electronics, controls, pneumatics, duct cleaning and sanitizing, lead safe practices, and the list goes on. 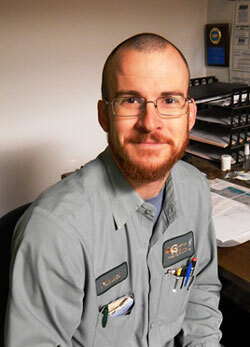 Brian holds a universal EPA refrigerant certification and is a master HVAC, master electrician, and master gasfitter. 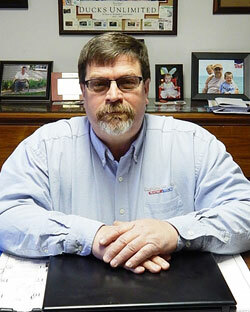 Brian’s other tradesman attachments include journeyman HVAC, Journeyman electrician, and journeyman gas fitter. He also holds a Virginia class “A” contractor’s license with classification in HVAC, electricity, and gas fitters. Brian sits on various industry, educational, and community advisory boards and participates in many community events. Brian’s duties include estimating, sales, design, fabricating, layout, installation, coordinating, installation team support, troubleshooting, service technician, customer support, and public/contractor relations. He is happy to live in such a great community and looks forward to working with you on your next heating or cooling project. As Custom Air’s business started to grow by leaps and bounds it became very obvious that we needed an inside person that could take care of all the administrative needs and requirements that is placed on any business, large or small. Don came on board in 1996 with many years of experience in the business sector putting things in place to, not only, meet those needs and requirements, but requiring accountability, keeping Custom Air on track for the past 20 years. Please meet Becky Reynolds our Office Manager. If calling the office she typically is the first person you will come in contact with. Becky takes great pride and concern in answering questions and performing basic troubleshooting over the phone. 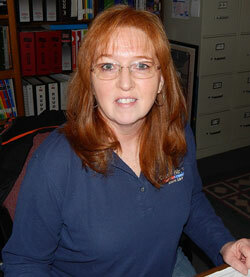 Becky comes from 20 plus years in the retail mercantile industry and has been with us since 2006. Becky is very comfortable working with our customers and strives to provide them with the best service possible. Becky’s duties include gathering and distributing incoming calls, dispatching, customer support, maintenance team support, material ordering, warranty claims, job costing, accounts payable and receivables. Becky is also active in her church and various community committees’. Please meet Stuart Orr our Service Manager. Stuart has been in the building trades (framing, electrical, HVAC, refrigeration, gas fitting, and plumbing) for the last 21 years. He is a graduate of the Smyth County Vocational School where he studied in the electricity program which included house wiring, Industrial motor controls, and electronics. While studying electronics he qualified and competed at a state level through the VICA organization where he placed 2nd in electronic motor controls. Stuart started with Custom Air in 1996 and at the same time continued his education at Virginia Highlands Community College where he studied and graduated with an associate’s degree in electro mechanical maintenance. As part of his advanced degree he chose HVAC & refrigeration as his elective classes. Stuart also holds a universal EPA certification and continually increases his education with industry provided classes for installation, diagnosing, and repairing various products. These classes have included gas piping, mini-split ductless heat pumps, oil burners/furnaces, gas furnaces, duct cleaning and sanitizing, heat pump thermo-dynamics, radiant floor heat, geo-thermal heat pumps, duct design and list goes on. Stuart’s duties include scheduling and technical support for all service personnel, service technician, job-site inspector, customer support specialist, and equipment installer. With 21 years of training and experience Stuart has proven himself to be an asset to Custom Air and is grateful for the community he has been blessed to work in and looks forward to serving the good people of our surrounding area in the years to come. Please meet our Installation Team. Left to right: Kevin Carter (Valley), Dave Ross (Brother), Denton Hull, Greg Chatham (G). 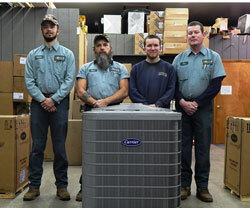 Our team of installers are the best in southwest Virginia. They participate in continuing education on new industry products, troubleshooting, and maintaining HVAC systems. They take great pride in quality installations of heat pumps, air conditioners, gas furnaces, oil furnaces, Hybrid heat, unit heaters, and ductless mini splits both in the residential & commercial application. This crew is very diverse and capable of installing all high and low voltage wiring, venting, gas piping, along with various controls in new construction and the retrofit application. They not only are the best installer around they maintain a great report with the homeowners and will treat your home with respect. They take great pride in leaving your home as neat as it was when they arrived. Please meet our Service Team. Left to right: Gary Shirey, Eric Harmon, Stuart Orr, Nathan Totten, and Stephen Collins. With more than 70 years of combined experience our service department is the best residential and light commercial service team in southwest Virginia. They participate in continuing education on all new and upcoming industry products, troubleshooting, and maintaining HVAC systems. 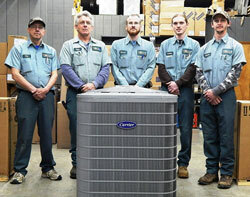 Custom Air, Inc. is a full service shop with service and maintenance after the sale. These technicians take great pride in evaluating, maintaining, and repairing all types and brands of heat pumps, air conditioners, Geothermal units, gas furnaces, oil furnaces, hybrid heat, Boilers, unit heaters, ductless mini splits, and indoor air quality products both in the residential & commercial application. Our service department also offers and performs monthly, quarterly, bi-annual filter changes for the residential and commercial setting. This crew is very diverse and is cross-trained to also perform equipment change outs and complete installations. The service department also performs electrical service upgrades, gas piping, venting, duct cleaning and sanitizing.